Yeah, Saki looks a little small. But it's still pretty darn cool! -->> ..the perspective is not to bad, and adds to the unique charm of the style, at least for artistic license . Shredder is in defensive so it is a bit understandable to account for size and him being a bit hunched over. You know, Saki wasn't named after Stan Saki, was he? :) Where did the name Oruko Saki come from? -->> Neil, would Pete and Kevin even have known Stan at that time ?!
' Saki ' is an alcoholic beverage correct ?? -->> BTW , Neil .. i recall Stan's earliest work on the old ' MASTERS OF THE UNIVERSE ' figure pack-in comics. You know, Saki wasn't named after Stan Saki, was he? :) Where did the name Oruko Saki come from?" ' Saki ' is an alcoholic beverage correct ? ?That's "sake". to bad it's pronounced // SAH kea //..much like the rain forest primate of of S. America .. The Saki monkeys .. now 'scuse me. Me n' the Saki boys gonna go out on a monkey night on the town, lotsa booze, sushi , n' sake. JUST A HECK OF A WHOLE LOTTA HANGIN' AROUND !! 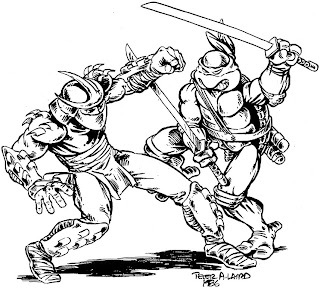 ..
Peter, I'd say Shredder looks a bit on the small side if I had to choose, but based on the perspective it's pretty close. Keep posting stuff like this, as a huge fan from my childhood, I love seeing the never-printed stuff!